We're absolutely mad about calorie-free Mrs. Dash. If you're trying to cut back on sodium, but hate eating boring, tasteless food, Mrs. Dash is just the gal you've been looking for. Mrs. Dash spices use things like garlic, onion, pepper, lemon zest and other flavorful food enhancers to make up its line of salt and MSG-free spice blends, which are all perfect for perking up your food. We especially like using the Lemon Pepper Blend on chicken breasts, and the Tomato Basil Garlic Blend in sauces, soups and on pizzas. Dash-licious! Love the rich, creamy, full taste of butter? Hate all the fat and calories that come along with it? You may want to give Molly McButter a try. This 5-calorie-per-serving, fat free, low sodium, butter-flavored powder gives everything you sprinkle it onto the great butter taste you're nuts about. Try it on steamed broccoli, baked potatoes, oatmeal or popcorn. Mmmmm, buttery. HG Heads Up! 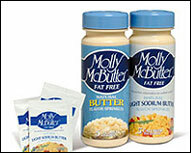 Molly McButter also comes in a low sodium version. There's no mistaking the strong, yummy taste and smell of garlic. Any food with a lot of garlic in it is sure to be super-flavorful. And when what you're eating is full of taste, you're much less likely to reach for a salt shaker. That's why garlic powder is so great when you're watching your sodium intake. And because sprinkling on some powdered garlic is so much easier than peeling, mincing, and cooking regular garlic, you'll likely use it more often than you would if you had to do all that work. Our advice? Keep some of this stuff handy and sprinkle away! Sans Sucre Cinnamon Sugar is perfect for sprinkling on oatmeal, cookie dough, toast, etc. And because it's made with Splenda instead of sugar, it's calorie-free! Cinnamon brings out the natural sweetness in food, and keeps blood sugar levels from spiking when you eat sweets. Add it to the sweetness of Splenda, and you've got a sweet 'n sassy spice sensation. Most BBQ sauces contain a surprising amount of calories, sugar and carbs. Not Hafa-Dai BBQ Sauce & Marinade. This all natural, sugar (and artificial sweetener) free sauce has just 5 calories per tablespoon. And, more importantly, it tastes great! Made from light, low sodium soy sauce, onions, white vinegar, and other spices, this zesty sauce gives chicken or beef just the right amount of tangy zip. Don't settle for dry, tasteless meat. Just go to www.guamBBQsauce.com to order a bottle of Hafa-Dai sauce. And don't forget to tell them Hungry Girl sent you. Tabasco Sauce is nothing new. It's been around forever. Not big fans of the spicy sauce, we've always thought it was nothing special. That's why we were so pleasantly surprised when we tasted the new Garlic Pepper Tabasco Sauce. Tabasco describes it as, "A milder member of the Tabasco family. It blends the flavor of garlic with three different peppers - a smoother cayenne, a small amount of oak-aged tabasco pepper, as well as mellow red jalapeño." We just describe it as good. Add a bit of the stuff to eggs, soups, just about anything really, to add a garlicky kick to your meal. HG Tip: Hot foods rev up your metabolism, so feel free to pour it on, baby! Are you a fan of Southern Barbecue? Give your BBQ authentic flavor with Corky's dry rub seasoning. Corky's Memphis restaurant is world famous for its incredible, finger-lickin' BBQ. And the best part is using this stuff will only add flavor to your meats. Not calories. And not fat. To try some of this awesome seasoning, check out www.corkysbbq.com. They'll Fed Ex your order right to you. Weeeee! Think beyond the noodles. Low cal and lycopene-rich tomato and marinara sauces are great on more than just spaghetti. Try them as a dipping sauce for veggies, bread, or pretzels, or as a sauce for chicken breasts, omelettes, or sauteed veggies. What are our favorite marinara sauces? We LOVE Buitoni Garden Vegetable sauce. Packed with huge chunks of fresh zucchini, tomatoes, summer squash and onions, it contains just 40 calories per serving. We also like Newman's Own Marinara Sauce, which has 70 calories in 1/2 cup, and Classico's Fire Roasted Tomato & Garlic Sauce, which has 50 calories per 1/2 cup serving. Today, January 12th, is National Marzipan Day. An ounce of marzipan has approximately 140 calories and 7g of fat. Share these sauce 'n spice finds with everyone you like. Click "send to a friend" NOW!